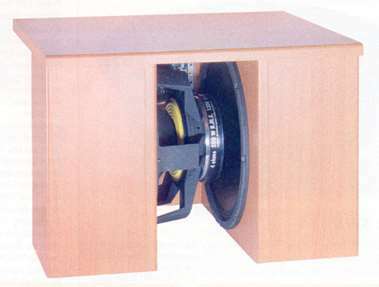 "Disub 18/2" is a dipolar subwoofer designed by Bernd Timmermann. This sub is perfectly suited for a music room where it should be placed approx. 2 metres from the rear wall in centre between the front speakers. Placed closely to the rear wall this sub doesn't work properly. In contrast to some smaller dipoles this one is quite efficient due to two large 18 inch bass drivers. The two drivers are mounted one behind the other, called W profile (according to Linkwitz). "Quite advantageous is the continuously variable phase adjustment of the Sitronik module, resulting in a perfect adaptation of the subwoofer to the satellites. It just snaps when the correct adjustment has been reached. The impeccable low bass of a dipolar subwoofer really needs to be heard to believe it: the beat of a kettledrum (Carl Orff: Carmina Burana, Telarc) just explodes without any warning, expands and vanishes the next moment. No vibration, no bass boom, just dry and tight bass. That's exactly how low bass should be, but we rarely experience this type of performance. Ray Brown's double bass (Oscar Petersen Trio: We Get Requests, Verve) was just mightier than usual, the strings seemed to be particularly tight. Especially impressive were the Kodo drums (Kodo: Heartbeat Drummers of Japan, Sheffield Lab)." Using a passive dipole results in an efficiency of 88-90 dB. Explanation: the dipole has a total efficiency of 95 dB. This value should be comparable to the efficiency of two satellites. Two satellites in phase, however, possess 6 dB more than just one (see interview with Dr. d'Appolito), resulting in 95 dB - 6 dB = 89 dB. We recommend the active dipole since volume and phase are adjustable. important hint: The measurements of AWX 184 have been changed. So don't build the cabinet according to the old measurements. Upon request we supply a 220 x 155 mm universal PCB, for mounting the component. 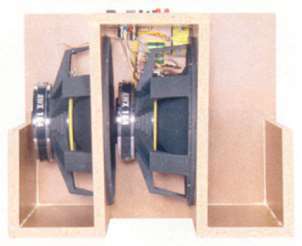 For the passive subwoofer we recommend 2 PCB's.